Sunshine Hardwood Flooring offers high-quality wood stair installation, refinishing, repairs, restoration, cleaning, and maintenance in the Boise area at an affordable price. As a licensed and insured, local hardwood flooring contractor for residential and commercial wood flooring projects, we are qualified to work with homeowners, realtors, and contractors throughout Boise, Meridian, Eagle, Star, Middleton, and Nampa. Our family-owned company has served thousands of satisfied customers over the years, and we are proud to say that most of our business comes from referrals and repeat clients. You can expect great customer service and excellent results with Sunshine Hardwood Flooring. Sunshine Hardwood Flooring's owner has more than 40 years of wood flooring experience and his team has more than 15 years of experience on average, so you can trust that your wood stairs will be installed and cared for by skilled craftsmen. For new installations, we typically install new unstained wood stair treads and risers on top of plywood, which we then sand, stain, and finish according to the industry's leading practices to achieve superior results. 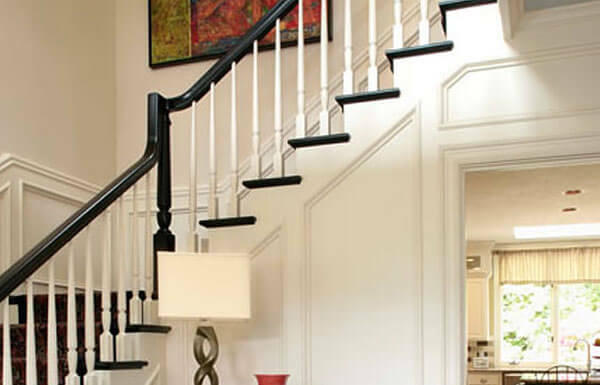 For wood stair restoration, we replace or repair any damaged boards and then proceed with sanding and the application of several coats of stain and finish. If your wood stairs are in fairly good condition and have not been contaminated by oils or acrylics, we can revive the look of your stairs by cleaning them and applying a two to three maintenance coats (buffing between each coat to ensure a smooth, flat surface). Our hardwood stair maintenance process is usually completed in less than a day and helps extend your floor's existing finish. Whether you want to replace your carpeted stairs with hardwood or add wood stairs as part of a home remodel with a second-floor addition, you can call up Sunshine Hardwood Flooring for a free on-site consultation and estimate in or near Boise. We welcome projects of all sizes, and are committed to treating our customers well. We'll arrive on time, work with a positive attitude, and thoroughly clean up after we're done. All you'll be left with is beautiful and resilient wooden stairs. We really appreciated you working over the holiday week and thanks for scheduling us so soon-no waiting. Great job floors look like new! We can't believe the difference. It's an amazing improvement. Love my floors!